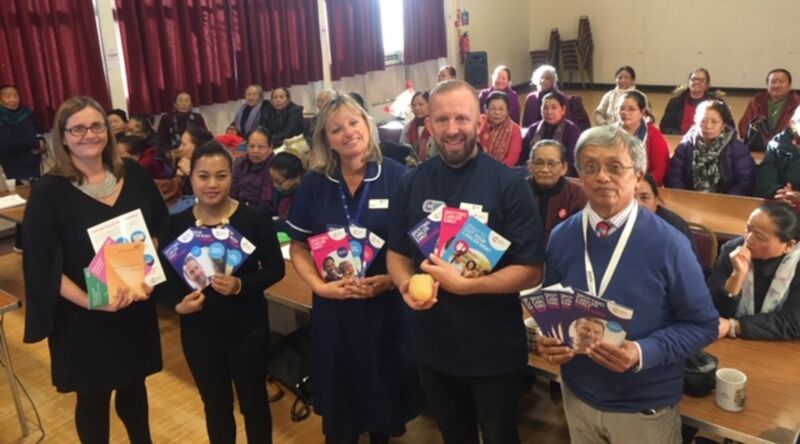 At Glyndon Community Centre yesterday, specialist cancer awareness nurses from a leading UK charity, with the help of local translators, shared their advice for preventing cancer with Nepalese residents. Lyndy Wesley and Tom Hawkins (pictured, centre) from Cancer Research UK, in partnership with Age UK, NHS Greenwich CCG and Greenwich Public Health, delivered a two-hour talk, covering key topic areas around cutting the risk of cancer. The session explored the link between lifestyle and cancer and looked at how choosing healthier habits like eating more fruit and vegetables, being more active, and keeping a healthy weight, alongside limiting the amount of alcohol we drink and stopping smoking, can all help to lower the risk of developing the disease. As well as the above, guests took home some practical tips and advice on the signs and symptoms to look out for, the whys and hows of NHS cancer screening, and the important role it plays in helping to detect cancer at an early stage, before there are any symptoms. Greenwich Macmillan GP and lead for cancer at Greenwich CCG, Dr Caroline Hollington (pictured, far left), opened the event, with Alina Vadiya (second from left), a nurse at Fairfield Practice in Charlton, offering her time and services to interpret the presentations into Nepalese. Some 50 people attended the session in Plumstead, the first of three interactive events Cancer Research plan to deliver for the Nepalese community. The charity and its local partners look forward to welcoming many new faces when it returns to a new venue, to repeat the session in January and February 2019. Missed it this time round? Find details of these and other upcoming events in Events and Activities.